When I learned that Gene Kelly was originally given the lead role in “Easter Parade” but had to step out when he broke his ankle, and would instead be replaced by Fred Astaire, I realized just how different Kelly and Astaire’s acting styles are, and how Kelly’s forceful chauvanistic attitude would have made this movie insufferable. And yet, Astaire’s grace and drive to focus on the show over romance makes the lead character so much more compelling after losing his broadway dance partner and gets so fed up with her that he’s convinced he could pick a random chorus girl and make her the next big star, though it certainly helps that he “randomly” picked Judy Garland. The plot reminded me a bit of “My Fair Lady,” plucking one “nobody” off the street and turning them into a somebody. It also has a very similar feel to Garland’s “A Star Is Born” as it chronicles her rise from learning the basics of Broadway to becoming the talk of the town. 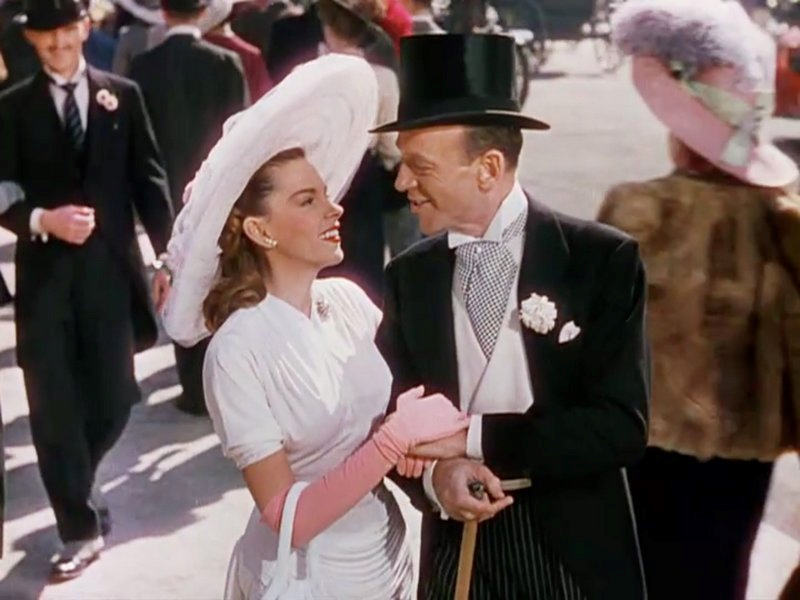 But “Easter Parade” benefits from a rather odd set of romances that at least one party always seems to be ignorant of. Along with Astaire and Garland, you also have his former dance partner (Ann Miller) and his best friend (Peter Lawford) who instantly falls for Garland. It’s not so much a love triangle, as much as a love rhombus. This certainly adds another dimension to an otherwise average musical, with Astaire and Garland both in their element.